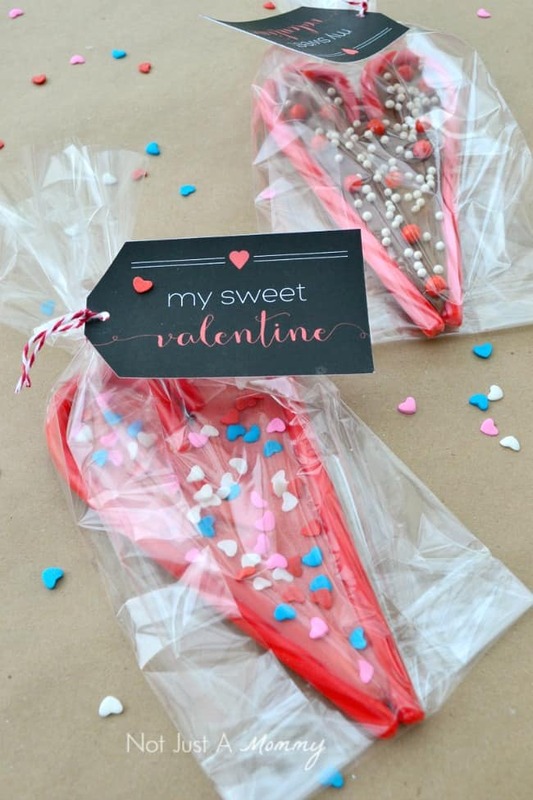 This Candy Cane Hearts post is courtesy of our contributor Dawn…Candy canes aren’t just for Christmas; head to the clearance aisle and grab a few boxes to make Candy Cane Hearts for Valentine’s Day. 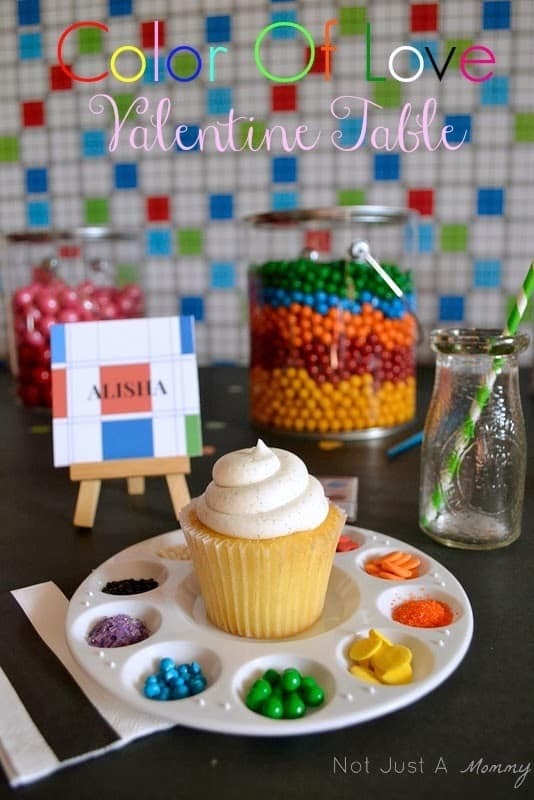 The kids will love making these; they are perfect for classroom and teacher treats. As if these aren’t cute enough, I created free 2” X 3” printable tags you can download to bag a few up for the perfect gift. Place waxed paper on a baking sheet. On the baking sheet, lay two candy canes next to each other to create a heart; create as many heart shapes as you need. 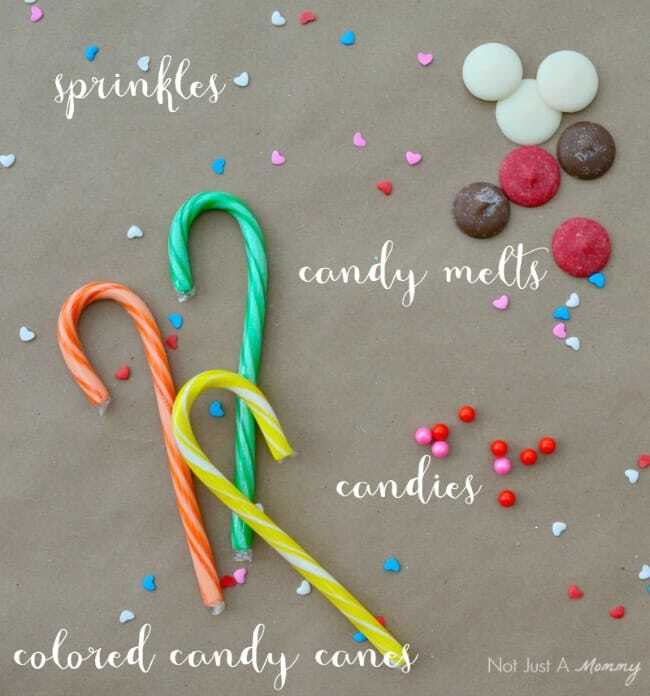 Melt the red and white candy melts together according to the directions to create pink candy melts. When the candy melts are melted, carefully spoon it into the heart shapes to fill them. Smooth the chocolate out as best as you can. Let the chocolate set for about a minute, then add the sprinkles/candy. If you add the sprinkles too soon, they will sink in the warm chocolate. 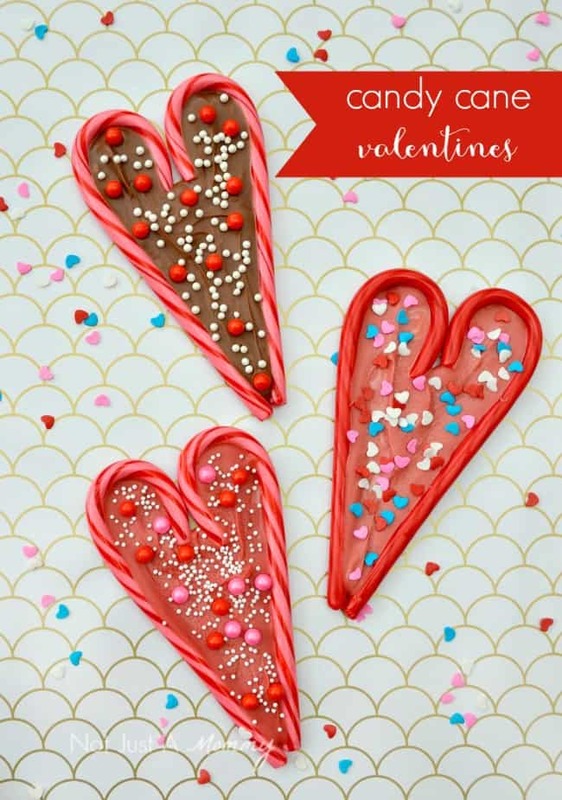 Melt the chocolate candy melts and repeat to make chocolate hearts. 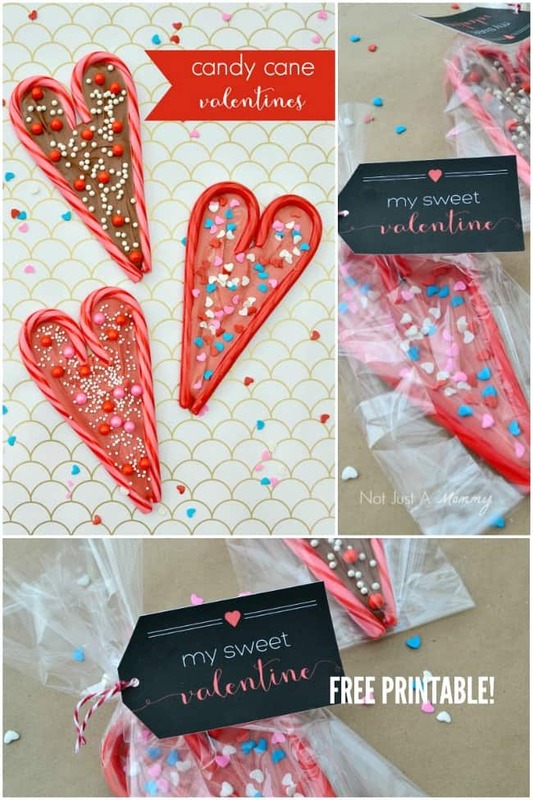 Set the baking sheet hearts on the counter (or in fridge for faster cooling) while the chocolate cools. Once cool, carefully remove hearts from the wax paper and bag in cello bags. 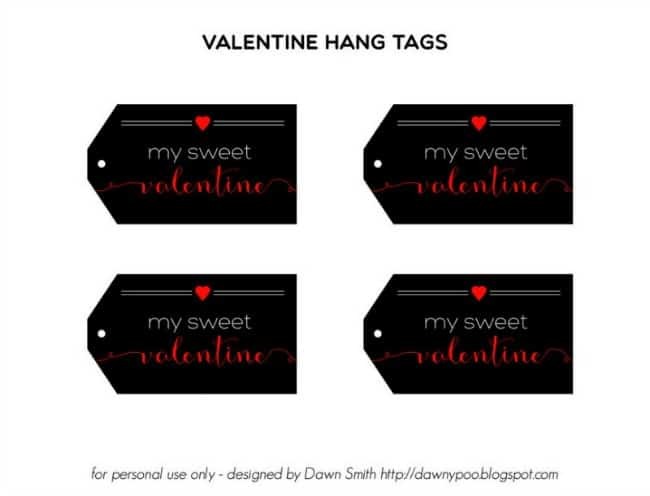 Finish off with printable tag, click here for the free download. Be sure and set your print setting to ‘Actual Size’. Need more Valentine’s Day inspiration? How about a twist on the theme with my Color Of Love Table? 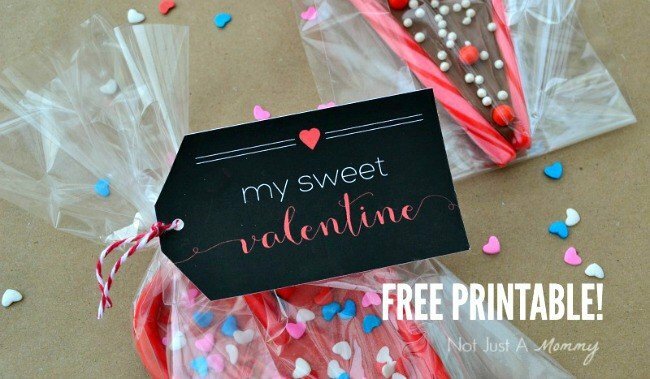 We’d like to send a big THANK YOU to Dawn of Not Just A Mommy for sharing this adorable Valentine’s Day tutorial & printable with us. Over on her blog you’ll find plenty of party inspiration – so many clever ideas that she makes easy to recreate for yourself! Be sure to follow her on Facebook, Pinterest and Twitter for even more creative ideas.